Space garage simulator Star Citizen has rocketed past a slightly impressive $50 million milestone this weekend, thanks in large part to the sale of some new Constellation class spaceships. A big chunk of that freshly donated cash will be spent on employing linguists, whose job it will be to create three real languages for the game’s three biggest alien races. There’s a Kubrickian trailer advertising the availability of the new ships, which require a whole crew of players to operate. There’s also a bit where a ship captain looks at a life-sustaining planet with a great big goofy smile, before revealing a rover presumably capable of going over ramps and doing skids inside craters. 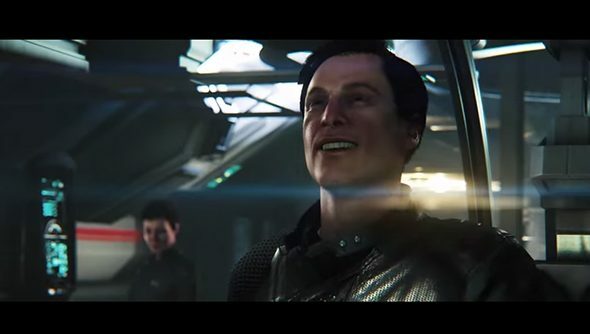 While reaching the most recent target means that Star Citizen’s major alien races will now speak in their own grammatically and syntactically correct tongue, it follows the announcement that the game will recieve two additional new modes. Vandal Swarm is a co-op dogfighting mode, while Murray Cup Racing, which looks a bit like WipeOut without the track. There’s a trailer for that too. Furthermore, and somewhat reassuring us that all of this money is going somewhere, Cloud Imperium Games showed off a slice of the game’s first-person shooting component. You’d better believe there’s a trailer about that too. And of course, a considerable sum of the raised money has gone towards the addition of flushable toilets.